Georgia Tech researchers have created a tool that allows adults to screen themselves for early signs of dementia. ClockReader is the actual test and is taken with a stylus and computer or tablet. The participant is given a specific time and instructed to draw a clock with numbers and the correct minute and hour hands. 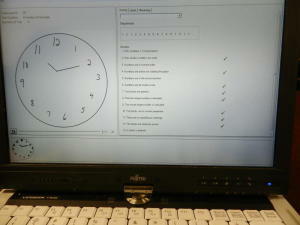 Once completed, the sketch is emailed to a clinician, who uses the ClockAnalyzer Application to score the test. The software checks for 13 traits. They include correct placement of numbers and hands without extra markings. People with cognitive impairment frequently draw clocks with missing or extra numbers. Digits are sometimes drawn outside of the clock. The time is often incorrect. In addition to scoring automatically and consistently, ClockAnalyzer records the duration of the test and the time between each stroke. The software also replays the drawing in real-time, allowing a clinician to watch the drawing being created to observe any behavior abnormality. And, because they’re saved electronically, the drawings can be used to easily compare a person’s cognitive ability progress or regression over time. Do’s research found that traditional tests are often filed in a folder and are rarely used for future comparison.